Back in February, I tried Clooz, and decided at the time that it didn’t seem to suit my purpose. However, for many years now, I have been trying to find an organization system that would work for me, but after numerous attempts, and abandoning each system because it wasn’t really working, I still hadn’t found one that worked for me. I therefore decided to give Clooz another try. I have been using Legacy Family Tree for several years now, and one of the benefits of Clooz is that it came import and export data directly between Clooz and Legacy Family Tree. As well as wanting to get my research organized, I have also wanted to restart my tree, to verify that everyone in my tree belongs there, and also because I haven’t always taken the time to set up my sources properly. 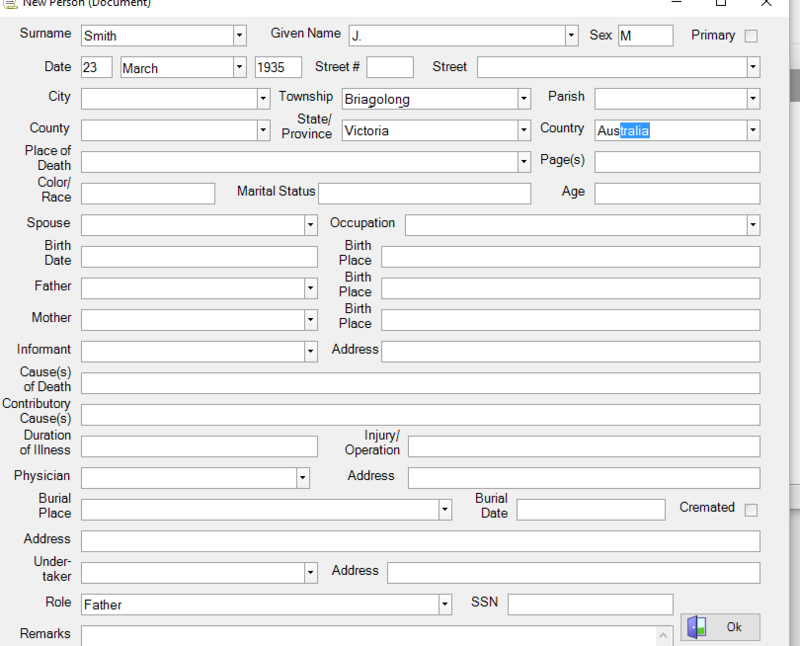 Since I will be entering the information into Clooz anyway, so that I can use it as an index, this will mean that I will be able to set up a new family tree at the same time. The videos I had found about Clooz on the Clooz website have seemed to focus on census records. My earliest research was here in Australia, where we don’t have census records. Even now, census records only represent a relatively small portion of the documents I have been working with. I found it difficult to know how to enter all these other type of documents into Clooz. I have therefore decided to share how I have entered the various documents into Clooz, to help others that may be having the same problem The first document in my notes is an obituary, so this is the first type of document I will look at. One of the first steps is to decide which Template to use: should I use the Generic Document, or the Death Record template? 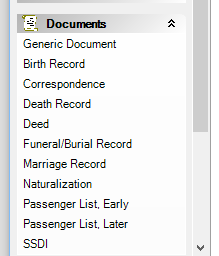 I decided to use the Death Record template, since I could include information about the death and burial, while the Generic Document would only allow me to select one type of event. The Clooz videos provide enough information about setting up sources, so I will skip ahead to when you start adding people, and setting up the details for each person. Since I first starting using a Windows computer in 1996, I have transcribed my family history documents into Microsoft Word. One of the benefits of Microsoft Word is that I can set up the Word document to resemble the original document. Another is that I can include in the Word file details about where the document came from. Another benefit is that I can either highlight in a different colour information I have added to my family tree (or Clooz), or delete the information as I go, so that I know what information I still need to add to my tree. 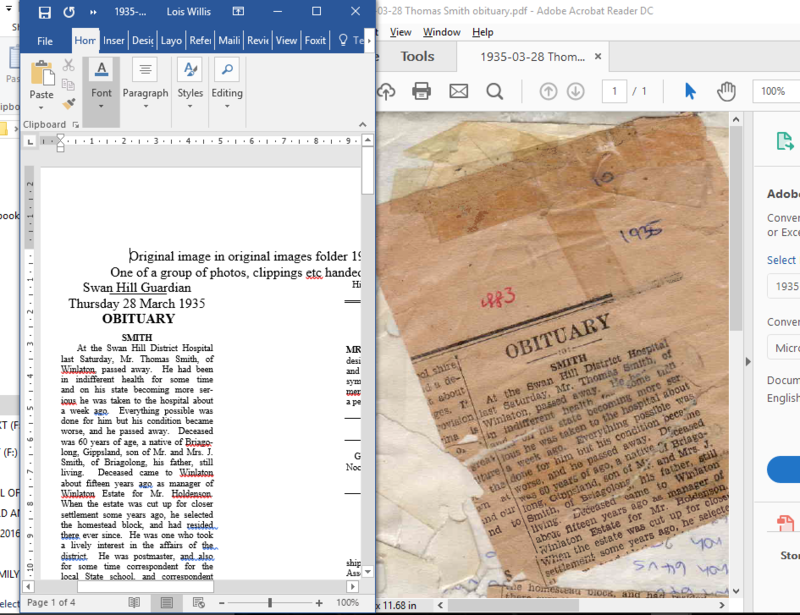 In my examples, I will be using my transcription of the obituary. The first thing is to set up the information for the person the obituary is about. Now that the primary person has been set up, I now need to set up records for everyone else mentioned in the obituary. As an example, here is the record for his father – I’ve included his residence, and his role (i.e.relationship). That’s pretty much all the information needed to the other people mentioned in the obituary. The next thing to show you is the information that shows up when you look at the People, Show Composite. This will show me all the people mentioned in the obituary, and when I look more closely at the entry for his father, and his two daughters Dorothea and May, it also shows where they were living. To begin with, I was frustrated because the relationships weren’t carried across into Legacy. 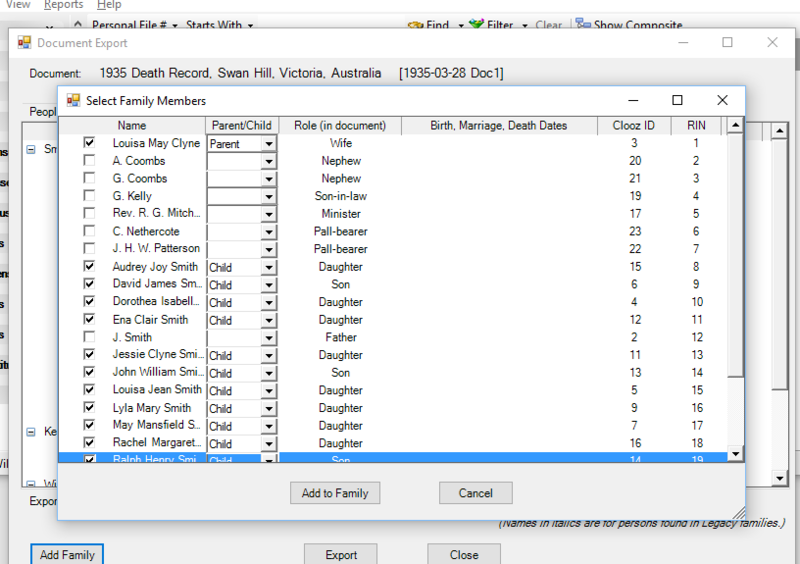 I then decided to have a look at the video about using Clooz with Legacy at http://familytreewebinars.com/download.php?webinar_id=390, and found that I hadn’t been using all the tabs when exporting a document, in particular the Families tab. For the relationships to be imported into Legacy, they need to be set up on this section. Below is an example of the family of Thomas Smith and Louisa May Clyne. 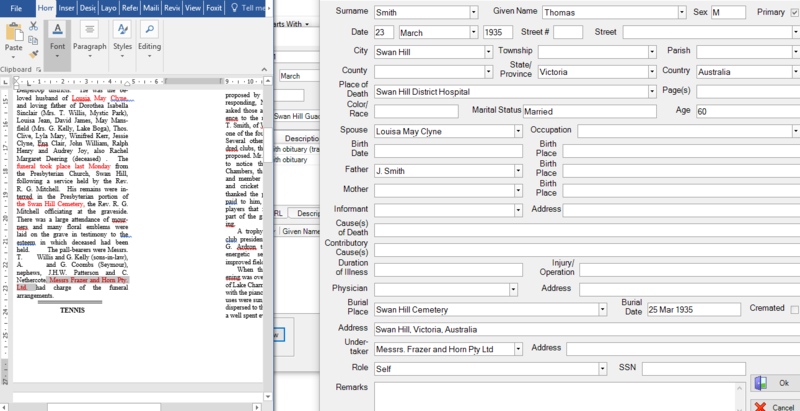 And this is the family group for Thomas in Legacy, after importing the document. I still had information on my original transcript that I didn’t have in my family tree. Also, although the location for his daughters and father showed up in Clooz, these events weren’t transferred into Legacy. So, I then added an obituary event for Thomas in Legacy, and copied the transcript of the obituary into the notes for this event, and I used the source clipboard to copy the source to this new event. I also added notes to the burial event, to show where his funeral service was held, and who conducted the service. I also added a residence event for him, his wife, his father, and his daughters Dorothea and May, and I entered a death date for his daughter Rachel “before 23 March 1935”, and used the source clipboard to copy the source to all these additional events as well.